An all the way win to Victoria. A superb win to David Cameron defeating Duncan Free of Queensland - one of the few time Free will ever be beaten in Australia. A comfortable win to Victoria. This was a great race between the top three crews with fine margins giving an indication of the tight racing. This was a strong win the South Australians against quality opposition. Bronwyn Roye dominated the event. 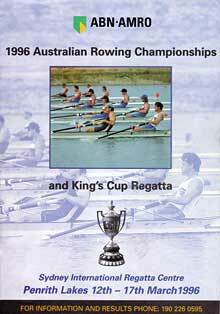 A good race between the winning NSW crew and the Victorians in a full field of seven crews. NSW women's youth eight finished first but were disqualified.